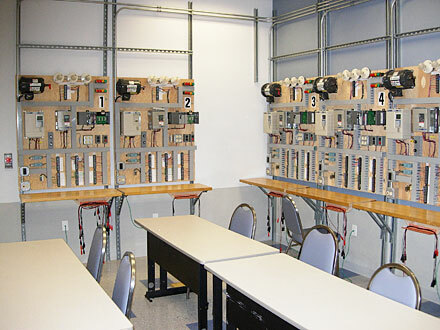 Apprentices utilize 20 stations of Allen Bradley SLC500 programmable logic controllers. RS 232 communications link the controllers to laptops which use RS Logix software by Rockwell Software. Apprentices receive 16 hours of training in this lab. Advanced night school students take a 42-hour training course.